Ras el–Teen Palace, which initially took the shape of a Roman fort characteristic of several round pillars and Italian ornaments inspired by the renaissance, is considered the oldest among existing palaces. It was erected on an area of around 17 thousand square meters surrounded by a marvelous garden of 12 feddans with a fountain decorated with 16 statues of mermaids holding fish on its northern side. Fig trees were planted in the site where the palace was constructed, due to which it was called Ras Al-Teen (fig). The palace remained, during the reign of different kings, to be used as the government headquarters, to which, they moved during the summer. 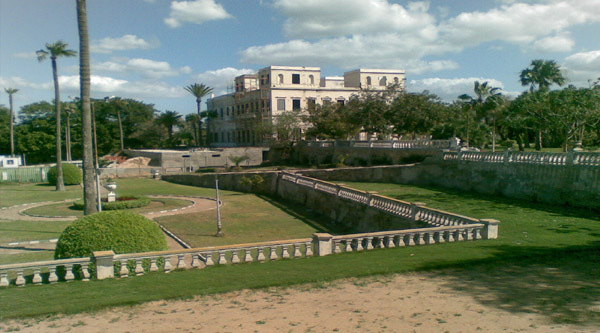 Different rulers made several changes to the palace, which was totally reconstructed, by King Fouad I, using modern design turning it to be similar to, but smaller than Abdeen Palace in Cairo. 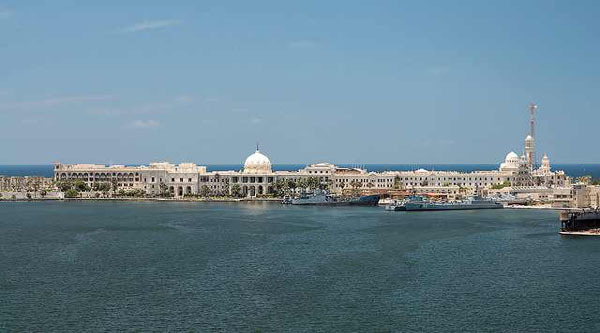 The former royal palace of Ras Al-Tin stands on the eastern seashore of Alexandria, its distinguished Italianate architecture serving as a memory of Egypt’s royalty. The palace witnessed the rise and fall of the Mohamed Ali family as Egypt’s rulers from the early 19th century until the abdication of the last king, Farouk, after the 1952 Revolution and his departure to exile in Italy. 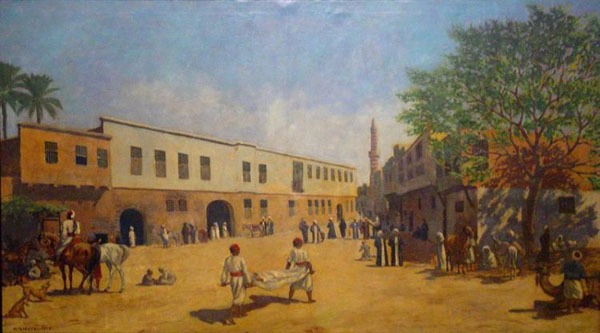 After the end of the monarchy, the Ras Al-Tin Palace like the other former royal palaces in the country was nationalized, though it continued to be used as a presidential residence. It was also used for hosting state guests. The palace’s construction was initiated by Mohamed Ali himself in 1834 to serve as one of the vice-regal palaces in Alexandria along with the Mahmoudeya and Ibrahim Pasha palaces. Architects and engineers like Yezi Bek and his assistants La Vial and Le Veroige were commissioned to design and build the palace, the work took 11 years. Construction work was over by 1845, but work on additional wings continued for two more years, and the palace was officially inaugurated in 1847. The garden of the palace is full of rare species of plants and there is also a private railway station for the royal train on the sight. The palace saw various developments after its completion in the mid 19th century, being reconstructed during the reign of King Fouad in the 1920s with modern services and new decoration making it similar to the Abdine Palace in Cairo. The reconstruction work was carried out by the Italian engineer Veroci at an original cost of some LE400,000. A covered swimming pool and a large attached hall were added at the time, and after World War II Farouk also built a marine pool on the Mediterranean breakwater. 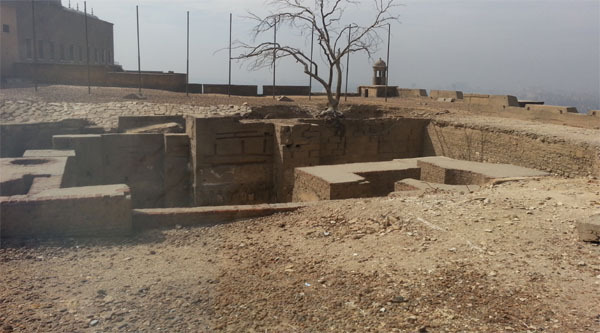 This pool was linked to the palace via a road along the breakwater and a Jeep could be used to drive along it. Next to the marine pool is a fully-furnished rest house with a bedroom, living room, kitchen, staff rooms and storage areas for fishing equipment. 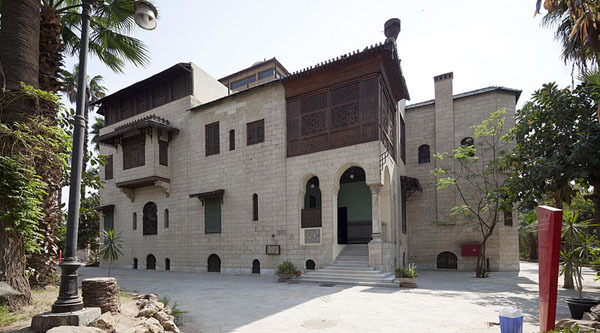 As a result of the changes the palace later underwent the eastern gate of the Ras Al-Tin Palace is the only completely original element from the original building that still exists today. The gate is composed of six granite pillars with Egyptian crowns used on their capitals and their lintels embellished with Quranic verses written in copper characters. The palace today has three reception halls on the first floor, dubbed the red, white and green halls, and there is also a throne hall similar to the one at Abdine Palace but of a smaller size. The king’s private office, conference hall, dining room and private rooms are decorated with gold and silver ornamentation and paintings. Farouk’s private wing at the palace includes his bedroom, office and bathroom, all similar to the ones at Abdine Palace. A large salon and small private dining room overlooking the sea are also found in this wing. 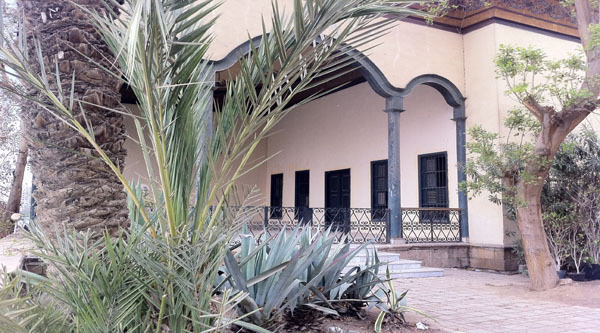 Elsewhere on the ground floor of the palace is the haramlek (women’s wing) and the servants quarters, as well as the hall where Farouk signed his abdication in 1952. The basement includes a third hall leading to stairs connected to the palace docks where Al-Mahrousa yacht was once housed. This took the king and the former royal family into exile in Italy after the 1952 Revolution. 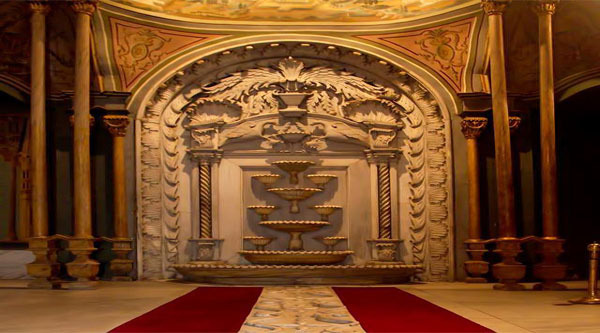 One of the most architecturally distinguished parts of the palace is the Gothic hall added by King Fouad, which employs a mix of architectural styles. Outside, behind the palace there are buildings that were once used by employees and staff. 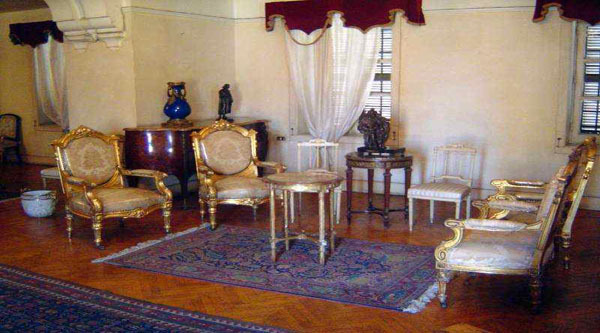 All the rooms in the palace are furnished using French decorative elements and furniture.